Along with the adjacent Hyatt Regency Hotel, Regency Casino is attracting an ever-increasing number of visitors and further to a continuous technical revision program, the management recently took the decision to upgrade and improve their CCTV system control facilities. Winning a competitive tender bid, Signal Electronics was chosen to specify and install the new control solution, with a brief to maximize the efficiency of the casino’s extensive camera network, while maintaining cost-effective control of the system. Fulfilling this brief, Signal specified Synectics’award-winning SynergyPro control software. Ensuring a simple and intuitive operator interface to the complex camera installation, SynergyPro control software was chosen due to its proven ability within major systems to create an optimum workstation environment. The requirement of the casino’s system operators and managers was to provide a practical control and administration solution that would deliver a high-level of flexibility of operation. Addressing this requirement, SynergyPro’s human interface to the casino’s multi-vendor hardware furnishes the system’s operators with a fast route to all common system functions. Underlining its simplicity of operation, used in conjunction with the SynergyPro software, the control of camera P/T/Z functions is performed via the aid of Synectics’sunique, multi-functional ‘Navigator’ hardware joystick controller. Using the Navigator, the casino’s CCTV operators can use a combination of side mounted ‘function’ buttons and joystick to select camera-to-monitor displays, and DVR playback control. These features provide the operators with simple, seamless integration between camera and playback control functionality, maximizing the surveillance system’s monitoring capabilities. Although SynergyPro is compatible with a vast range of third party manufacturers’ equipment, Signal Electronics specified a Synectics Tesseract SLC 512x48 switching matrix for its robust and reliable long-term operation. Featuring a modular design, all Synectics Tesseract matrices utilize the ‘tried and tested’ SYN-NETTM Operating System, ensuring simple and effective system expansion if and when necessary. To archive the visual information supplied from the extensive camera network, Signal supplied the Thessaloniki casino with Synectics MDRS technology. Providing a scalable and flexible recording solution it allows casino staff to retrieve visual data quickly and easily, resolving disputed table wins rapidly. With each pit boss also able to retrieve data from their pit boss station, claims can be resolved at the table, instantly allowing play to resume. 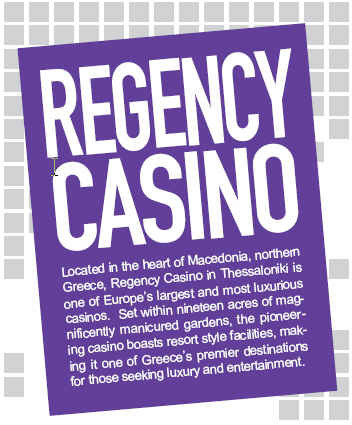 The second of the two casinos, Regency Casino Mont Parnes is the only gaming facility located in the greater Athens area. 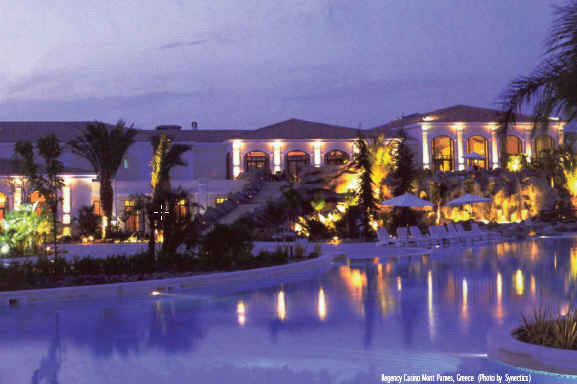 Following the acquisition of 49% ownership two and a half years ago, by the consortium of Hyatt Regency Hotels & Tourism (Hellas) and Elliniki Technodomiki, its annual turnover has grown to over €140 million per year. An interim renovation project at a cost of €11 million was completed within the first few months of takeover, while the first phase of an ambitious €110 million program to fully reconstruct the complex is now underway. Once this project is completed, the new complex will have a new state-of-the-art cable car system, a five star hotel, a luxurious spa with indoor-outdoor pool, various bars and restaurants, as well as extensive gaming facilities with 1,500 slot machines and 110 tables -- making it one of the top tourism destinations in Europe. Following the success and subsequent performance benefits gained with the use of Synectics products at the Regency Casino, the same tried and tested formula was applied to Mont Parnes, with the use of Synectics’ SynergyPro control, coupled with Tesseract camera switching matrices.